Have you noticed how words and sayings become trendy? I’ve noted the term “lean in” has become popular among bloggers. I went back through my book, The 31 Days of Hope, and realized I had used that term in one of the devotions, trends tend to be catchy! And, trends are interesting. My husband and daughter even tell me that I’m a trend-setter! 2002, late in the year, the Lord pressed heavily into me and spoke HOPE deep within my spirit. It has become the very heartbeat of my life. My family and friends began gifting me with HOPE items! I have HOPE in every room of our home and even have a ‘tree of HOPE’, which stays up all year long. Since that time in 2002 – it seems like everyone began using the word HOPE. Hope is an awesome thing to have! How about the blessing trend? Remember when the words blessed, bless, blessing used to be considered “Christianese”? Now, everyone uses those words. Yes, I am a trend-observer! Now, this word is trending. to depend or rely (usually followed by on or upon). A couple of those definitions shed some heavenly light, yes? As a believer, I want to lean on, rest against, be supported by, depend on, rely upon the bedrock Truth of God’s Word. I am one of those people who believe every word in The Word is God-breathed. It is reliable and dependable and I can lean in and rest a while – a long while – a lifetime of while! That’s a good question! 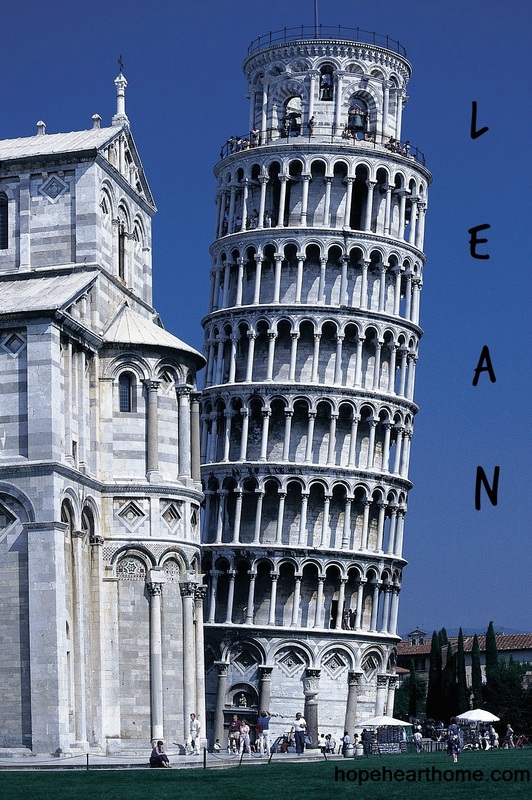 “Are you leaning?” It’s good for us to make a self-assessment now and then to realize if we are leaning on a God or something not so sturdy!! Thanks for this. Visiting for coffee from Holleys! Rachel, I’m about to return the visit – make a fresh pot! Great to be your neighbor today sharing in your Three Words Wednesday post. Your words, especially Lean In do resonate with me! Thank you for sharing!!! Bethany, always a delight to share space with you! I notice a lot of stuff like that too, with the word trends. I love the concept of leaning in. Sometimes it’s hard because you want to run, but you are so right, it all comes down to the word of God. Leaning, trusting, and yielding. Thanks for this inspiring post Susan! Natalie, I always enjoy what you write and comment! I have leaned heavily on God, and my friends like you! A lot of times I lean on my husband when I really should be leaning on God. Thanks for the great thoughts! Lean on me any ole day, Melissa, I’ll steer you right back to HIM! Yesterday we were leaning on God during the entire 9 hours of my brother’s back surgery. Today we’re rejoicing from the wonderful word’s of the surgeon that all went well and he is in stable condition. No one better than the Lord to lean on . Donna, nothing beats those everlasting arms! Heather, HOPE, a word very dear to my heart! All this is so familiar, it reminds me of 1986 when Donna went through chemo. A friend told me where there was life there is always hope. We did lean on the Lord and not our own understanding. Great reflection, thanks for sharing. It’s certainly not “wrong” per se to lean on people; however, our ultimate satisfaction must be found in our Lord and Savior. Well I love this – because, of course! 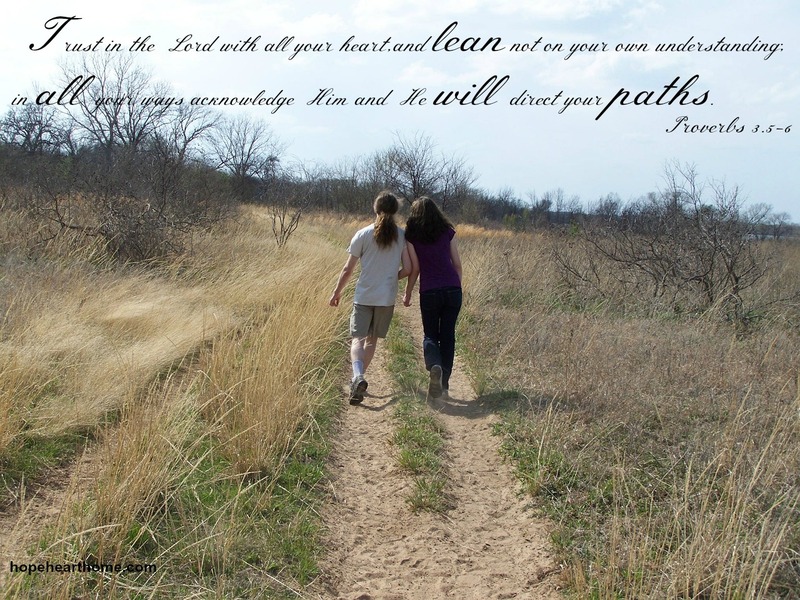 I have been writing about Leaning In to God for years now and leaning on Him, too! Kindred, yet again! A trendsetter! You are, Karrilee. We’re all leaning on something – even the people who say they don’t believe in God are learning on their beliefs in that. So, yes, what — or, rather WHO — we choose to lean into is life-changing. Grateful for your words here! Good point, Kristin! I choose to lean on The Solid Rock! You are indeed a trend setter! 🙂 I am not. In fact, usually I am behind the eight ball when it comes to setting trends! 😛 That Proverbs 3 verse is so beautiful. I have always liked that verse. I want to lean into God too. Somedays that is so much easier said than done though…if you know what I mean. When I worked at camp we did “trust falls” during staff training, we had to trust our colleagues and trust that they would catch us when we fell back. I think God wants us to know that God is always there and will always catch us. We just need to lean in! Tara, Proverbs 3.5-6 is the life verse of many and they certainly chose well. When we lean on ourselves, it’s a recipe for disaster! I love the new trend! Such a great word-lean. Lean your entire personality on the Lord (amplified paraphrased). Stopping by from Three Word Wednesday! Blessings! Kathleen, how does one not lean on Him, in this precarious world we live in? Thank you for stopping by.